Thank you so much starting a monthly gift. You chose to help - to be kind and generous and stand by children when they need you most. 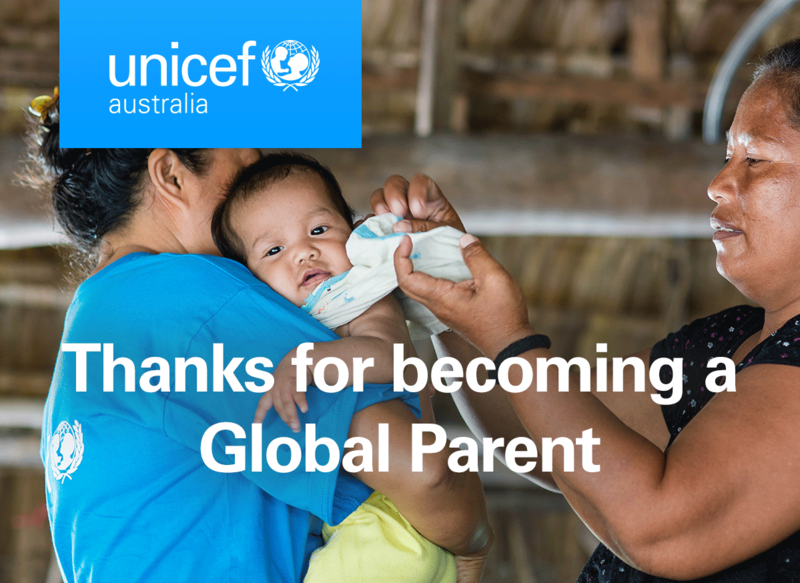 You’re now one of UNICEF Australia’s most important supporters - part of a generous community called Global Parents. You’ll help UNICEF be there to help children survive wherever they need us most in 190 countries throughout the world. Your ongoing support means that many more children can be given the best opportunity to survive their first crucial 1,000 days of life and thrive well beyond it. Because of your support, more mothers and babies will access essential healthcare, nutrition, clean water and protection. Because of you more mothers and babies will survive. Thank you. Please find the details of your first monthly donation below. All subsequent monthly donations will be debited from your nominated account on the 15th of each month, or on the nearest business day. And since your donations to UNICEF Australia over $2 are tax deductible, we will send you a consolidated receipt at the end of the financial year. If you have any questions regarding your donation, please call our Supporter Relations team on 1300 134 071 or email us at support@unicef.org.au. Thank you again for your commitment to saving more lives and giving more children the best start possible.